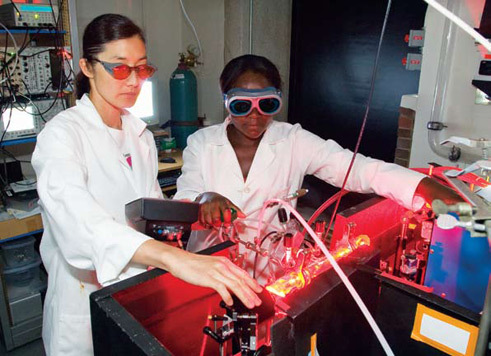 Venturing Into the "Visceral Pleasure of Discovery"
Smith sophomore Margaret Nyamumbo shares lab time with Associate Professor of Chemistry Shizuka Hsieh. Photo by Jim Gipe. Among the revelations that Rosalie Ray had last summer as a student researcher in the Clark Science Center and Smith Research Fellows Program is that there is great value in what she offhandedly refers to as "fuddling around." By that she means the time–honored practice every researcher knows about but can't necessarily name: call it trial and error, following one's nose, grabbing fortuitously serendipitous encounters, educated guessing, groping or even just thinking. Experienced academics know that what Ray, a Smith junior majoring in economics, hit upon is actually the value–added part of what is commonly referred to simply as research. Last year a faculty working group, co–chaired by professors Rob Dorit and Kevin Quashie, examined what it might mean for the college to move toward making a "culture of research" one of the hallmarks of a Smith education. Among the group's goals is to have more students experience the kind of epiphany Ray had while engaged in a project aimed at helping farmers in northeastern Haiti become energy independent. The group's report, framed as "a set of goals, a set of possibilities," is intended as a starting point for a campuswide conversation about how research—or what the working group came to call "purposeful inquiry"—might be infused into every level of every discipline and major at Smith, whether in the humanities, natural sciences, engineering or the social sciences. Dorit, associate professor of biological sciences, says the committee started out with a more modest agenda of boosting the recognition of existing research opportunities at Smith and of tweaking teaching practices to more fully recognize the value of research. "We evolved into wanting to gain a comprehensive understanding of what research at Smith meant," says Dorit. The work Ray did during the summer between her sophomore and junior years exemplifies the intellectual strides students can make when they are challenged to think for themselves. Together with Judith Cardell, Clare Booth Luce Associate Professor of Computer Science and Engineering, Ray set out to find ways of promoting renewable sources of energy in rural areas of developing countries. She settled on a project that involved providing research support to an Oxfam International team that is currently operating in Haiti. In particular, they are looking at how to use the jatropha bean, which grows on a drought–resistant shrub, as a source of plant oil that can be very useful in the production of biodiesel. Working with professor of computer science and engineering Judith Cardell (left), Smith junior Rosalie Ray set out to find ways of promoting renewable sources of energy in rural areas of developing countries. In particular, she chose a project that provides research support to an Oxfam International team operating in Haiti. Photo by Jim Gipe. Among Ray's tasks was to identify resources and information that the group in Haiti needed. She didn't have a good idea where to start, but that didn't stop her from going, in her own un–jargon, "online and sort of fuddling around." Not only did Ray find information that addressed her immediate inquiry, but she also came across other organizations that ended up being of great value to her partners in the field. "So in the fuddling about and trying to figure out where should this go and where should this be, it ended up turning up good things," says Ray. Reflecting on the learning process, Ray believes that venturing forth into unknown territory ended up not only yielding new directions for her curiosity but also building her confidence as a student. "I don't think I really learned how to do research until I had this summer to figure it out." In the past, she says, she experienced a bit of a letdown when teachers spoon–fed her ideas on where to gather information. "I found it really frustrating at the beginning that my professors always seemed to be able to find the one thing that had all the data I needed," says Ray. "I could get the paper done, but I never really delved into the topic." Margaret Nyamumbo, a sophomore who hasn't yet declared a major but is leaning toward chemistry, had her own research epiphanies while participating in the Summer Research Fellows Program. She worked with Shizuka Hsieh, associate professor of chemistry, on a project aimed at better understanding the links between atmospheric hydroperoxide and ozone depletion. Unlike the experiments Nyamumbo had done in classroom situations, where the results were predictable, her summer research "was very exciting because you didn't know what you were going to find out," she says. Moreover, when the actual results are unexpected or even counterintuitive "you have to come up with better ideas to understand complex reactions," she says. Doing actual research also taught Nyamumbo some things about herself. "I learned that I am a very hands–on person," she says. "When I do something I learn it more than when I'm just reading something in theory or watching." Kevin Quashie. Photo by Jim Gipe. Dorit would like to see the kinds of experiences Ray and Nyamumbo relate become part of all areas of learning at Smith. "We are not suggesting that every student do an honors thesis or that every student do a lab course—those are fairly blunt tools," says Dorit. "We are suggesting that every professor look at their syllabus with an eye to weaving in elements of inquiry." In making recommendations like this, the working group was careful in its report to acknowledge the existing demands on faculty and students and the fact that "each discipline within the academy defines purposeful inquiry and its prerequisites differently." Understanding the "visceral pleasure of discovery" is a key to education for the 21st century, says Dorit. Noting that Smith's graduates will enter a world "characterized by dense information and complex problems," the working group framed its recommendations as a commitment to produce "scholars who can bring intellectual agility and rigor to these complex problems and who can exhibit a love of discovery." Ideally, that intellectual agility and rigor reflect an education that is responsive to the world today and leads to an ability to participate in public debates and to think about areas that transcend academic boundaries. "The days when you could say, 'I'm interested in the humanities but not the sciences' or 'I'm interested in the sciences and not the humanities' are over," says Dorit. By way of example he notes that "you cannot be a fully functioning citizen in a democratic society if you are not in a position to discuss genetic testing." Having intelligent opinions on a subject like that requires knowing enough about science to understand what genetic testing is, and at the same time "being sufficiently versed in ethics to know what the ethical issues are." The bottom line, says Dorit, is that it is unacceptable to shirk these debates by saying, "that wasn't my major." Instilling a culture of research or purposeful inquiry into a Smith education would emphasize the importance of independent, intellectually driven work. In fact, many of the ingredients of the "culture of research" have long been in place at Smith, the working group noted. Among them are the Celebrating Collaborations: Students and Faculty Working Together conference, now in its seventh year, which showcases and celebrates the scholarly work of Smith students; the Summer Research Fellows Program, which marked its 40th year in 2007; a notably high level of faculty research, much of it supported by grants totaling more than $5 million a year; and even orientation offerings like Intellectual Inquiry, which starts students as investigators, of sorts, before they formally set foot in a classroom. 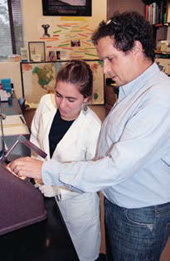 Rob Dorit with Paula Turini GR ’09. Photo by Judith Roberge. One of the working group's recommendations is to make sure students encounter opportunities for independent work from the outset of their Smith careers. 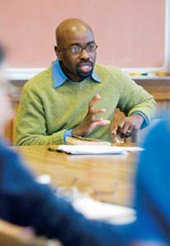 Too often research is thought of in terms of the "glamour of an honors thesis" or as a rarified activity for those who have spent years paying academic dues, explains Quashie, associate professor of Afro–American studies. That's too bad, he says, because spending time investigating things you are interested in is among the most fruitful ways of absorbing and internalizing information. "We should be thinking of the kinds of experiences we can give students to help them become local experts on bits of information early on, even before they become, quote unquote, more advanced in their career," says Quashie. Sophomore Kassia Rudd, who is majoring in German, spent much of the summer at a National Oceanic and Atmospheric Administration laboratory in North Carolina studying how to restore sea grass habitats. Among her duties was to use a geographic information system (GIS) to do mapping. She had never done that before, she says, "and I mostly learned by screwing up." For Rudd, purposeful inquiry is another way of saying "learning with intent." Doing research, she says, "gives you a broader range of knowledge and prepares you better to figure out what you want to know." And the part about screwing up? Quashie says that's part of the design: failure plays an important role in the practice of purposeful inquiry. Allowing students the luxury of not having to succeed all the time ends up making them better learners, he says, because blind alleys inevitably end up widening the scope of inquiry. Recognizing that purposeful inquiry is worth pursuing, even though it can be time–consuming or lead to dead ends, requires a leap of faith, Quashie acknowledges. But as campus conversations continue about the role of research and purposeful inquiry in liberal arts education, he and Dorit are confident that Smith will be guided by a longstanding sense of mission and purpose. "Smith has always occupied a vanguard position among American colleges," Dorit says, "and has always been interested in not being part of the pack, but in leading the pack." Restoring the habitats of Halodule wrightii, an important subtropical species of seagrass found off the coast of North Carolina, was the focus of Smith sophomore Kassia Rudd's summer research project.